When we moved to West Virginia right before my senior year, I’d pretty much resigned myself to thick accents, dodgy Internet access, and a whole lot of boring.... until I spotted my hot neighbour, with his looming height and eerie green eyes. Things were looking up. **SPECIAL FEATURE** E-book version of this title includes two bonus scenes from Daemon's point of view at the end! I had seen so many rave reviews for Obsidian that I have to admit I was a bit nervous to start reading it. My expectations had been raised so high that I was worried the book wouldn't live up to them and I have to admit in the beginning I didn't think it was going to. There were quite a few similarities with another popular YA series which made the storyline feel familiar and some events were quite predictable. However, despite my initial reservations Obsidian really grew on me and the further you read the less familiar it becomes as it starts to move off in it's own direction. I loved Katy from the beginning, she is the kind of character that any book blogger will be able to relate to because she shares our love of books, blogging and her online community. I loved her comments about her blog and the way she was so excited to gain new followers or receive books in the post and I could totally understand her joy at finally getting internet access at their new home! Along with being a bit of a nerdy book lover Katy is also an intelligent girl and a good friend. She is immediately drawn to the hot boy next door but she isn't going to let anyone talk to her the way Daemon does without telling them exactly what she thinks of them. I was so pleased that she called him out whenever he was acting like a jerk (which unfortunately was quite regularly!). Daemon isn't the only one she stands up to though and there was a particular scene in the school cafeteria that practically had me jumping up and down and waving pompoms to cheer her on. Now let's talk some more about Daemon. He totally has the hot body and good looks going for him but his attitude stinks. I think Katy said it best: "Beautiful face. Beautiful body. Horrible attitude. It was the holy trinity of hot boys." He was such a complete jerk for the majority of the book and there were times I wanted to reach into the book and shake some sense into him. But no matter how badly he acts he has something about him that draws you in so I could completely understand Katy's attraction. The only word to describe the chemistry between these two is intense. They scorch the pages in every scene and you can never quite tell if they're going to tear each others heads off or start ripping their clothes off! I haven't come across so much heat in a YA book in a long time and that alone makes it worth reading the book. The more you get to know Daemon the more you start to see a sweeter side to him, he keeps that side well hidden but just those glimpses leave you wanting to get to know him better. I have to mention how much I loved the fact that this series is about aliens rather than the usual vampires, shapeshifters, angels or demons. I don't think I've actually come across any other YA paranormal romance or urban fantasy books about aliens (but if you know of any good ones please let me know because I'd love to read them!) so that made a really nice change. I'm not going to say much about Jennifer L Armentrout's alien mythology because I think it's something you want to discover yourself as you read the book but I did find it really interesting and well thought out. I'm looking forward to learning more about the Luxen as the series continues. 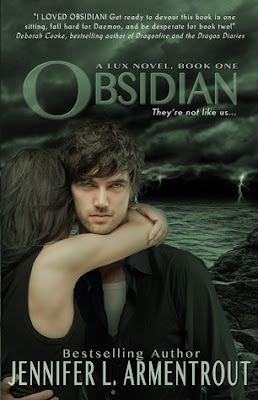 So I have to say that Obsidian surprised me, after a shaky start it did manage to live up to the hype that has surrounded it and it has made me want to check out more books by Jennifer L. Armentrout. I will definitely be picking up a copy of the next book Onyx when it is released in August. One last thing I want to mention is that if you're a fan of this series then make sure you check out the extra scenes she has written and posted on her website. You'll get to see some of the important scenes from the book but told from Daemon's perspective and I promise they'll just make you love him even more! The Kindle version of the book even had a couple of extra scenes included at the end that aren't on her website (and I don't believe they're included in the paperback either so I'm glad I purchased the kindle edition). I must have totally missed the hype for this one somehow--I hadn't even heard of it before! Interesting to see that aliens may be coming back; there's been such a dearth of anything sci-fi oriented in YA of late. Hi Stephanie, I did really enjoy this one after I got past the similarities so I'd recommend giving it a try if you're looking for something a bit different. I haven't come across many aliens in YA so if you have any recommendations I'd love to hear them!